It has been a while, far too long, since I last posted to this blog. Our little world has been shaken up and turned on its head. Joe received some pretty staggering news last week. He had been informed by Dependable Transport that their insurance company has an age restriction for their drivers and he had been unceremoniously dumped on February 3, 2015. This news could not have come at a worse time. Then again, when is it ever a good time to be told that you can no longer work with a company? Truth be told, we had been expecting it for a couple years. We both knew when we signed on with Dependable Transport in 2004 that they had a cut off age of 72. Joe got a few more years with them after their age restriction. It still was quite a blow to his ego to be told that their insurance company would no longer cover them for any accidents or damages that were incurred by Joe while he was under dispatch. He was furious. Once the anger subsided my poor Joe was dumbfounded. Being the man that he is, it didn’t take long before he began shaking trees, as he calls it. By the early afternoon of February 3rd he made a call to a company we both had originally drove with – Coldiron Companies – to see if they had an age restriction and would hire him back on. Their insurance company does not have an age restriction. Only require the drivers they hire as Independent Contractors to be able to do their job. So my poor husband has “sucked it up” and is working once again. He is doing two things he hates doing. Flying in an airplane and driving Deck Sets. Flying – if Joe were at the controls he would feel better about that mode of transportation. He doesn’t trust the pilots. Deck Sets – they have a reputation for being difficult and dangerous. Joe left home on Sunday, February 7th, from Will Rogers Airport in Oklahoma City on a flight to San Antonio, Texas. He had a lay over in Dallas, Texas for an hour before arriving in San Antonio. He was to be met at the airport by a representative from Coldiron to pick him up and take him to the place he would be handed the keys to the trucks he would be delivering to Morgantown, Pennyslvania. 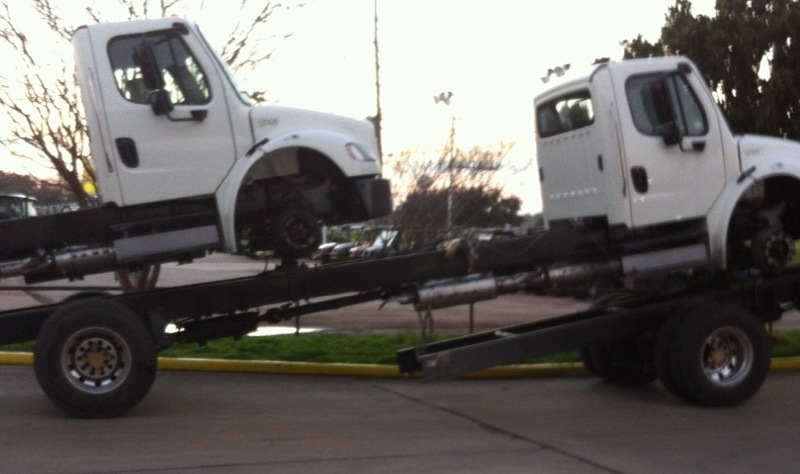 The trucks in the photo are known as “Cab and Chassis”. Once the trucks arrive at their destination they will be outfitted with a box on the frame. These trucks will become something most of you are familiar seeing. A U-Haul truck to move your household belongings when you “Do-It-Yourself”. Or they will be turned into a refrigerated city delivery truck that will deliver food to restaurants. Or they will be outfitted for a beverage company that will deliver soft drinks or beer. 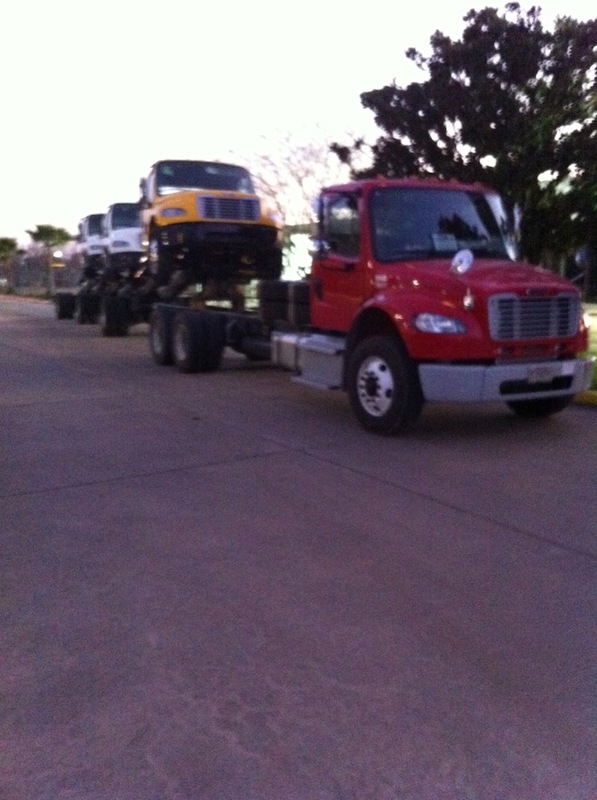 It all depends on the specifications of the buyer what these trucks will be put to use for. The “Cab & Chassis” is just as it seems. The truck cab and the frame. During Joe’s 1700 + mile trip cross country he will have to make stops to check the nuts of the “Saddle Mounts” to ensure they are tight and remain secure. 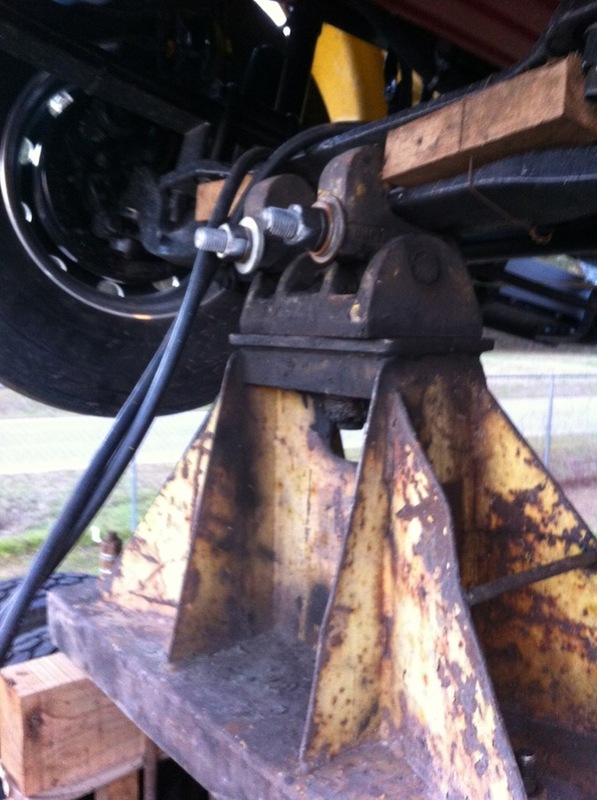 The “Saddle Mount” is a piece of equipment that attaches the frame of the front axle of the decked truck onto the frame of the truck it is mounted to. Joe has to carry tools with him to do this job. Unlike with our pickup and the tool boxes he has on the trailer, he has to tuck his tools away in his suitcase and have that bag checked in at the airport. On the part of the Saddle Mount that is attached to the frame of the truck carrying the other are specialty bolts known as “U Bolts”. As the name implies, they are “U” shaped for a reason. 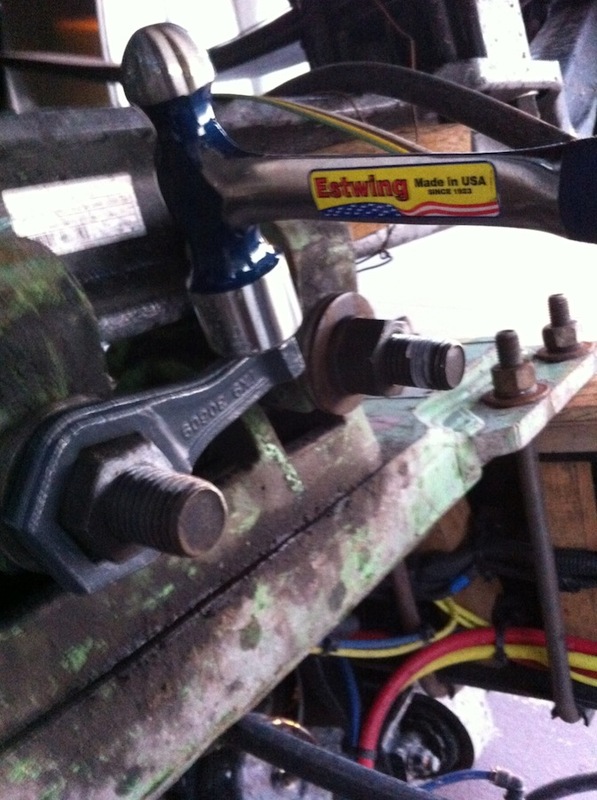 The bolt is placed around the beam of the frame and secured to the Saddle Mount. Two for each side, as you can see in the photo above. There is a better photo of this below. The wood that is atop the frame is there to protect the frame from the metal to metal contact between the Saddle Mount and the truck frame. The wood, during the transport process, shrinks. To ensure the equipment is secured safely it is imperative that it be checked twice a day, at a minimum. In the photo above Joe is tightening the nuts that secure the “U” Bolts to the frame. He has to snug up all of them. 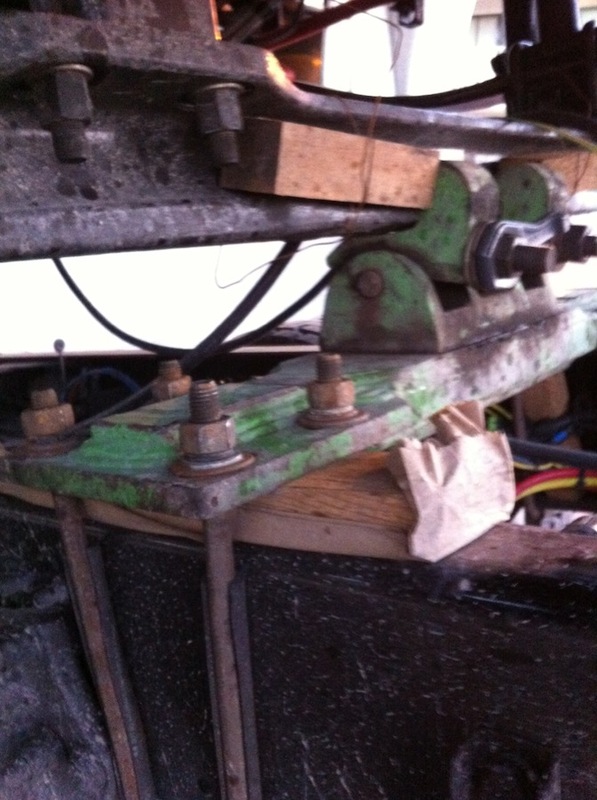 The next part of the Saddle Mount structure is the part that secures the truck to the frame below. The bolt configuration on this part of the equipment is known as the “J” Bolt. This bolt is shaped like the letter “J”. 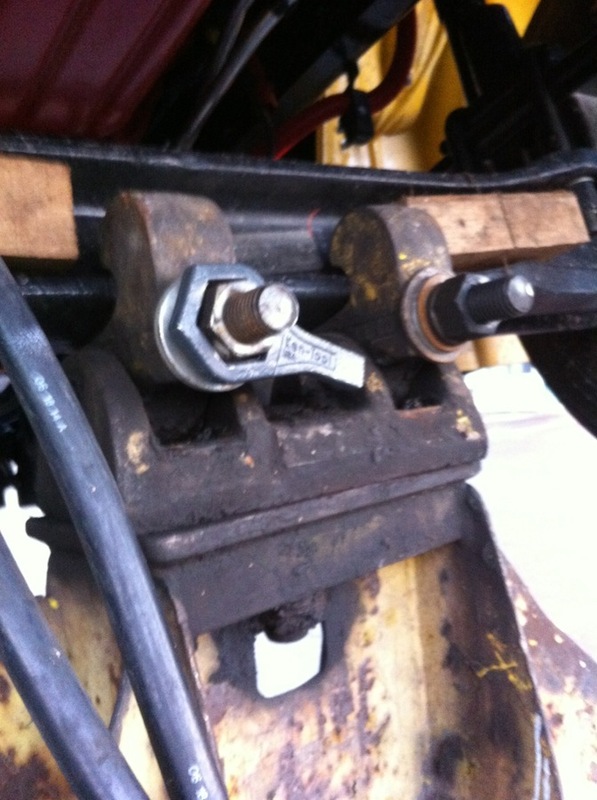 The hook end, or “J” is secured to the upper cross frame of the truck on top and held in place by a nut that needs a specialty wrench. The wrench needed for this part of the job is called a “Pork Chop”. This wrench requires the use of a 2 Pound Hammer to tighten the nuts during transport. 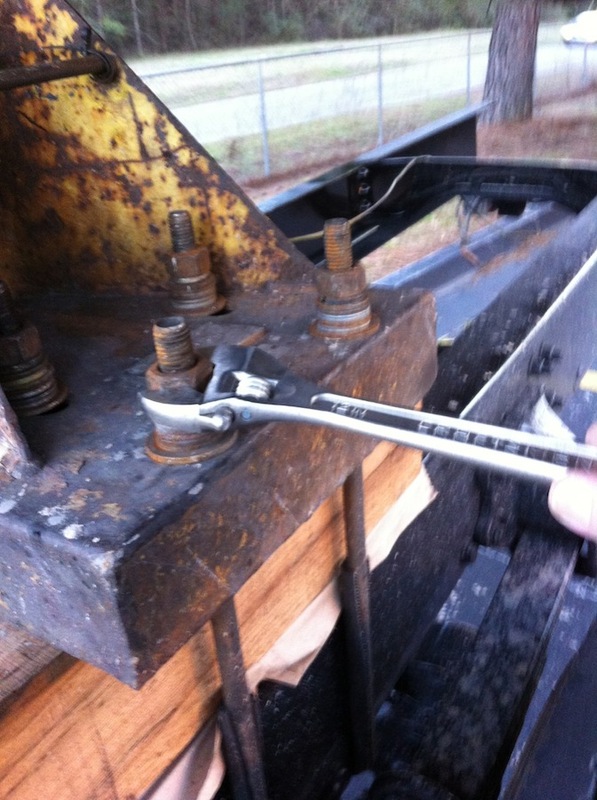 Using the hammer on the wrench is the only way to make sure the nuts are tightened properly on the “J” Bolts. Joe will be delivering these trucks this afternoon in Morgantown, Pennsylvania. He has been told he will be taking a “Box Truck” out of there to deliver somewhere. Once he has completed that part of his journey he will get back on a plane to San Antonio, Texas to do this all over again. As far as the pay goes…not the best. He is getting about $0.49 per mile on these trips. Quite a cut in pay from the $1.30 per mile we had been earning. Coldiron pays for the flights, which is a good thing. They also pay for the fuel used to deliver the trucks. So Joe is not much more than a “Company Driver” at this point. Coldiron does give him a hotel fee of $50 per night. These are new trucks and no one is allowed to sleep in these trucks….or eat in them. We have talked about the financial aspect of this first trip of his. It is a learning curve he has to go through. Figuring out the cost of fuel he will need to purchase for the trip and there have been no hotels he’s stayed in that are at the $50 rate – even the “Budget Hotels” charge $70 or more. Joe has lost the ability to find food that is not all hot dogs and sub sandwiches or burgers. Finding hotels along his route that have open parking areas for the Deck Sets has been a trial. I have spent a couple hours with him each day looking at Google Maps in the Satellite mode to look at the hotel properties to ensure he can safely get in and around the buildings. It has been interesting to say the least. For the time being, Joe will be driving the Deck Sets until he can get in the system and work his way back into using his trailer. That will allow him to earn better pay and he will not be subjected constantly to truck stop food….nor airplane flights. So…till next time…bye for now.